On the shores of the city’s treasured Lake Austin, Orleans Harbor reigns as one of the most desirable gated condominium locations. Over the years, the community has been evolving stylishly with major renovations creating one gorgeous residence after another. Individual statements of style and taste are reflected in these coveted homes hidden behind verdant courtyards. 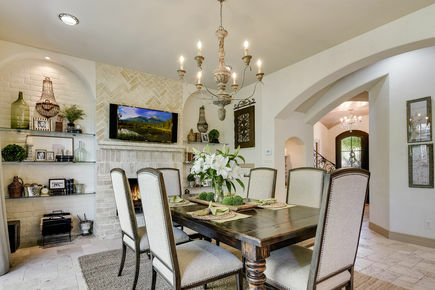 2433 Westlake Drive is completely and lovingly remodeled with artistry, resulting in a dream environment of peace and privacy close to downtown. An easily accessible boat dock allows for a quick cruise around the lake or a lazy day on one the most beautiful bodies of water in Texas. The lovely elements and professionally selected surfaces inside evoke a French coastal experience and create a world of soft colors and exquisite craftsmanship that invite you to love being at home. 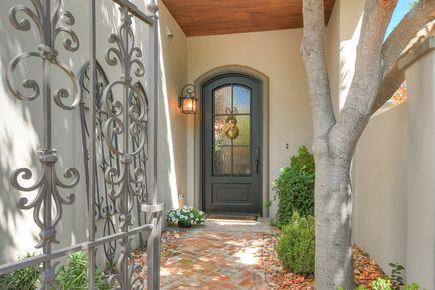 An intimate, gated courtyard leads to a simple, refined, iron and glass front door that opens to the elegance of a burnished cathedral-vault entry. 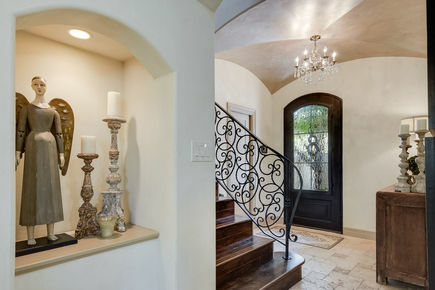 Soft ivory walls throughout the home are presented in a venetian plaster finish accented by brick walls washed in perfectly coordinated muted tones that create a luxurious but organic feel. Travertine floors flow throughout the downstairs and wood floors above. Beamed ceilings, understated antique French chandeliers, and a wood burning fireplace crafts serene environs for life on the Lake. Designed for quiet repose away from the world, this home is also a hub for entertaining and embraces friends and family to share the surroundings. 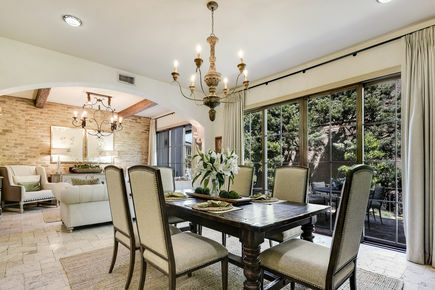 Living and dining areas open through two sets of recently installed huge glass doors onto the large and private patio covered in herringbone antique brick and enveloped in thick, artful landscaping. The kitchen lacks nothing and seems to have been plucked from a French design magazine. Light, glazed perimeter custom cabinetry with a contrasting island that houses a large, undermount porcelain sink. Designed to maximize storage and with details important to the serious (or just adventurous) cook, there are spice racks, lined knife drawers, trash pullouts, refrigerator drawers, in addition to the paneled refrigerator, wall oven, microwave and a Thermador induction 5-burner cooktop. Off the kitchen is the laundry room with storage, built in ironing board and a utility sink. Plenty of recently installed storage cabinets line the garage and the floor has been freshly coated with epoxy. 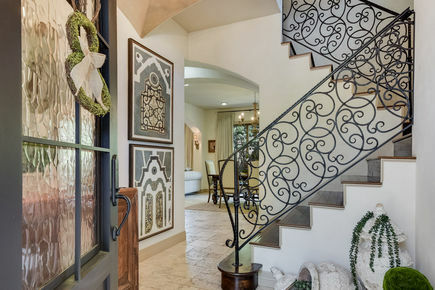 Up the wood stairway flanked by a scrolled iron handrail, the three bedrooms have their own views and individual style and were crafted with the same soft colors and high quality finishes as the main living areas. 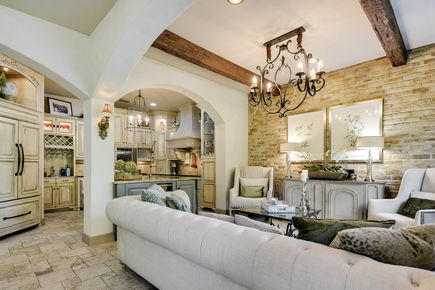 Barrel vaults in one, cross-member beams in another and the tray ceiling master make each a special retreat. The master bath is graced by double burnished cathedral ceilings, each adorned with a beautiful crystal chandelier. The result is a captivating escape for a sumptuous soak in the jetted tub or a long luxurious shower under beautiful tiles behind the glass door. This unit is among three in the entire complex that have a water view from both the front and the back of the home…..you can enjoy the private balcony on the front which is accessed from two of the bedrooms or the upstairs balcony which has a view of the harbor and is accessed from the master and the third bedroom. This end unit enjoys ample parking for your guest! This is a rare opportunity to become a part of one of Austin’s favorite treasures. And, yes, there is an incredible community pool on the shore of Lake Austin. Come live here. We love this place.